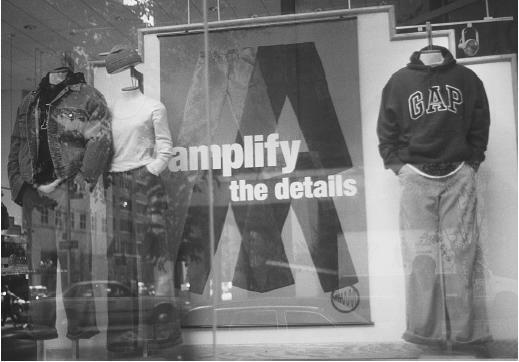 Display window from a Gap store, fall 1998.
separates for men and women, and added propietary brands, throughout the 1970s; went public on NYSE, 1976; added retail stores throughout the U.S. and abroad; purchased Banana Republic chain, 1983; GapKids introduced, 1986; BabyGap, 1989; GapShoes, 1993; Old Navy Clothing Company launched, 1994; bath and body products introduced, 1994; BodyGap established, 1998; reached 2,600 stores and sales of $9 billion, 1999; flagship Paris store opened, 1999; flagship London store, opened 2001; added sizing for larger women, 2001. Awards: Sales and Marketing Management Marketing Achievement award, 1991; American Choreography awards, Governor's award (for the support of dance), 2000. Company Address: 1 Harrison Street, San Francisco, California, 94105, USA. Company Website: www.gap.com . Hoover, Gary, et al., Hoover's Handbook of American Business 1994, Austin, TX, 1993. Pederson, Jay P. (ed. ), International Directory of Company Histories, Detroit, MI, 1996. Forman, Ellen, "Widening The Gap," in DNR, 26 May 1987. Conant, Jennet, "The Age of McFashion: Specialty Stores are Selling Prepackaged Style for Busy Shoppers," in Newsweek, 28 September 1987. Callagher, Sue, and Ros Ormiston, "Filling The Gap," in Fashion Weekly (London), 16 November 1989. Van Meter, Jonathan, "Fast Fashion," in Vogue, June 1990. Kantrowitz, Barbara, "Now You Can Crawl into The Gap," in Newsweek, 29 October 1990. "Ready, Set, Gap!" in Harper's Bazaar, February 1991. Pogoda, Dianne M., and Thomas Ciampi, "Growing The Gap," in WWD, 6 January 1992. Kahn, Alice, "Filling Every Gap…," in the New York Times 23August 1992. Tyrer, Kathy, "Back to Basics: Gap Too Hip for Its Britches in the Value-Oriented 1990s," in Adweek Western Advertising News, 9 November 1992. Ozzard, Janet, "Is The Gap Losing Its Fashion Edge?" in WWD, 9June 1993. The Gap store on Sixth Avenue, New York City, winter 2000. Mitchell, Russel, "The Gap Dolls Itself Up," in Business Week, 21March 1994. Strom, Stephanie, "How Gap Inc. Spells Revenge," in the New York Times, 24 April 1994. "Who's Who in the American Sportswear Market 1995," in Sportswear International (New York), Vol. 13, May 1994. Duff, Christina, "'Bobby Short Wore Khakis'—Who is He and Who Cares?" in the Wall Street Journal, 16 February 1995. Caminiti, Susan, "Will Old Navy Fill The Gap?" in Fortune, 18March 1996. Bensimon, Giles, "How They Learned to Stop Worrying and Love The Gap," in Elle, April 1996. Barboza, David, "The Gap Brings Wall Street a Casual Friday," in the New York Times, 27 September 1997. Moomey, Kelly, "Banana Republic vs. The Gap vs. Old Navy," in Consumer Reports, May 1998. "The Jean Pool," in Forbes, 11 October 1999. "Mend that Gap," in Time, 14 February 2000. Kaufman, Leslie, "Sales at Gap and Limited Spur Fears of Slow Season," in the New York Times, 30 November 2000. "Gap Goes After Larger-Size Women," in Marketing to Women: Addressing Women and Women's Sensibilities, May 2001. At a time when the disenfranchised youth of America threatened much of the status quo, a new store aptly name "The Gap" opened in San Francisco. It was 1969 and Donald Fisher, a successful real estate developer, had an idea to capitalize on the growing "generation gap," by offering young people what they wanted—blue jeans and music. While jeans made by the venerable Levi Strauss & Company could be found in local department stores, size and availability were restricted and the antiestablishment youth was unlikey to shop there. Fisher, along with his wife Doris, decided to fill this void in a hip, fully-stocked atmosphere. The Fishers parlayed cool tunes and low-priced Levi's jeans into a chain of stores in California, then the remainder of the U.S. and eventually abroad. By continually changing its clothing (which had grown from just Levi's to shirts, skirts, shorts, jackets, and other casual separates) to keep up with the evolving trends of baby boomers, The Gap became a hip hangout for jeans lovers from 18 to 49 years of age. By the early 1970s Gap introduced its own labeled apparel and the company went public in 1976. Despite ups and downs in the ensuing years, The Gap remained a firm purveyor of style for the casually dressed crowd. 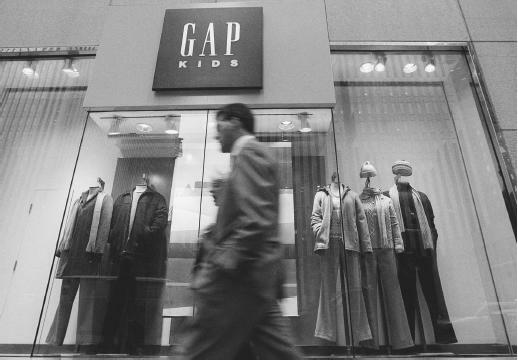 In the late 1980s Millard "Mickey" Drexler, formerly of Ann Taylor, revamped the Gap organization. From the ground up, Drexler recreated the company, ridding stores of all nonproprietary brands, bringing in a team of designers to produce casual apparel from natural fibers for men and women, then children (GapKids debuted in 1986, BabyGap in 1989). The Gap had begun print and media advertising in earnest, not only attracting new customers, but changing its image along the way. The Fishers had also acquired another California-based company, Banana Republic, and opened the first international Gap store in London. In the 1990s BabyGap grew into a major retailer, Banana Republic experienced a welcome resurgence in popularity, and a new lower-priced franchise called Old Navy Clothing Company became an immediate success. In 1996 several titans of fashion, including Giorgio Armani, Nino Cerruti, Carolina Herrera, Todd Oldham, and Cynthia Rowley, paid tribute to the clothier in the April issue of Elle magazine, all wearing Gap apparel. There were now hundreds of Gap stores dotting Europe and increasingly renowned print and television advertising for both Gap and Old Navy. As the 20th century closed and the 21st arrived, the Fishers had retired but retained a healthy stake in the now-legendary clothing empire. The second generation of Fishers, three sons, worked in some capacity in the family business, while Mickey Drexler continued to reign in the executive suite. In nearly every metropolitan area was a Gap, GapKids, BabyGap, Banana Republic, or Old Navy store, or a combination storefront featuring both adult and children's clothing. Shrewd marketing, tight control, exceptional quality, and consistency in an ever-evolving and inconsistent marketplace has kept The Gap, Inc. at the forefront of the apparel and accessories industry. There's Banana Republic for the higher-end market, Gap for the middle road, and Old Navy for lower-priced dressing with style and panache. With sales topping $11 billion by 2000, the Gap's empire seemed boundless; further evidence of the company's continuing acuity was its expansion into cyberspace, with a very popular website.